While Jay and Silent Bob's Super Groovy Cartoon Movie, available this week On Demand, may satiate appetites for the View Askewniverse, fans still want to know when they can expect the next live action movie, which will be Clerks III. It's a sequel that will end the big screen adventures of Jay and Bob, though according to star Jason Mewes, the pair may live on in yet a second animated movie. Clerks III was supposed to not only be Kevin Smith's final View Askewniverse movie, but also his final movie as a film director. He planned to retire after this chapter in his life came to a close. But as they do, plans changed, and he got sidetracked. Instead of doing Clerks III as his next movie, he moved onto the horror thriller Tusk. After shooting was completed on that low budget indie, he then decided to make another small horror movie with Anti-Claus. So where does that leave Clerks III? 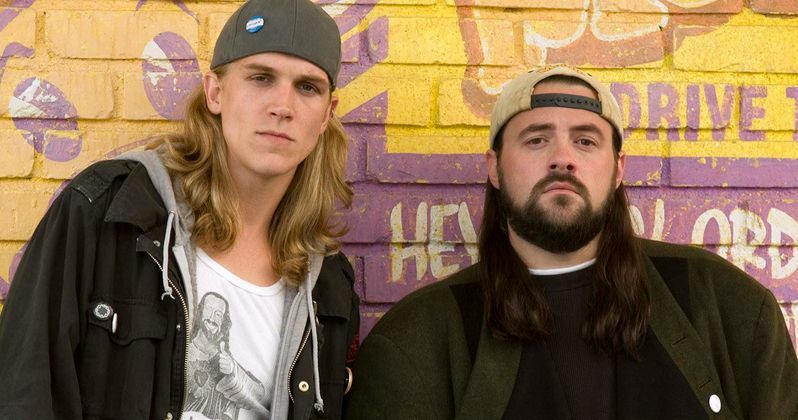 We recently talked to Jason Mewes for the release of Jay and Silent Bob's Super Groovy Cartoon Movie on VOD, and he claims Clerks III will be shooting by the end of this year. He also went into some of the backstory on why we're getting two more Kevin Smith movies before this anticipated sequel hits theaters. "I know for a fact that Kevin really wants to do that. The first delay was because he was waiting on the Weinsteins. They have the rights to one and two. They get the first look at it. So, Kevin wrote it, and the budget was higher than normal. It was higher than the other movies. They had sixty days to give him a yes or no. So, while he was waiting, he came up with the idea for Tusk. Then the Weinsteins came back and said, "Why don't you get the budget down, and we'll talk again." So we had to...Well, not us...My wife actually runs the company, and is a big part of SmodCo, and she does a bunch of this stuff, she is way smarter than I am. But anyway, we had to get the budget down. While we were doing that, Kevin had this Tusk idea, and he said, "Well, it's done. And it will only be this amount of money. While we wait on Clerks III, why don't we do this?" That's why that happened. Now, he has written another horror movie right after. He was still waiting for an answer, so he said, "Look, why don't I maybe do this movie?" He really wants to do Clerks III, but he really wants it to be the right timing. It's a higher budget than the first two. To be honest, in general, and not just with him, it seems like they're only making Captain America movies and X-Men movies, that are $200 million, or they are making a movie that only cost between $1 million and $2 million. So, you have a $10 or $15 million budget? It will happen...But he had these other two movies, and he already did the one. Now he'll do the second horror movie, and then he'll move right into Clerks III. As for the storyline, it's amazing. I don't think I'm allowed to say anything. I know, every time we do a Q&A, he talks about it. But he doesn't give too much away. I have read it a couple of times. The difference to me is that you are laughing and crying. Its serious and honestly, it's fantastic. Hopefully things pan out like they should, and we start shooting by the end of the year. I'm really looking forward to it. I know, I look at it, and I'm going to be playing Jay at 40. Really? But again, I think it would be the perfect movie to stop Jay and Bob, or the View Askewniverse, or whatever he wants to call it. Honest to goodness, it's a good script." During our interview, Jason Mewes explained how Kevin likes to pull from real life situations and his own past history. While Jason has gotten married in real life, don't expect the same fate to befall Jay on screen. "No, he won't be married in the movie. he won't be married, that won't adapt...I don't think Jay...Ah, it still would be fun! But in the movie, he didn't write it as he's been married. There are changes in the movie. The new script. It has more recent stuff. It is honestly great, I'm not just saying that. I have read it a couple of times, and I love it. If everything goes according to plan, it should start shooting by the end of the year." While we wait for Clerks III, Jason himself is busy writing a sequel to Jay and Silent Bob's Super Groovy Cartoon Movie. He shared some of what we can expect. This next one is all me, and a buddy of mine, Clark, he is a writer and he is helping me with the format. And some of the other stuff. I'm really excited, because we're almost done, and it's really cool. Then I'm going to give it to Kevin, and then he will do a pass on the script. Make it what he likes. Then we'll see what we do with that. Kevin came up with the idea of where he wanted to take it. But then I have been going over all the different stuff. I wanted to see what I wanted to add. We're going around stopping Michael Bay from making all these remakes. So, that was Kevin's idea. From there, I was able to put in all the stuff I wanted to see, like robots and goofiness. I added a bunch of different elements to it. Just different stuff. I don't want to give it away, but I was able to add in a bunch of stuff that I had ideas for that we could do with animation, that you couldn't do unless you were going to have a blockbuster budget on a live action jam. I got to do all of this in the cartoon. I just read it again, and I'm waiting for Kevin to read over it again and give his notes. But I'm really excited about it. I think it's going to be better than the first one. We like the first one, don't get me wrong. It's just a little different."